Arturia caught our attention with Storm, the virtual studio suite, but of late they've diversified into emulating classic hardware instruments. 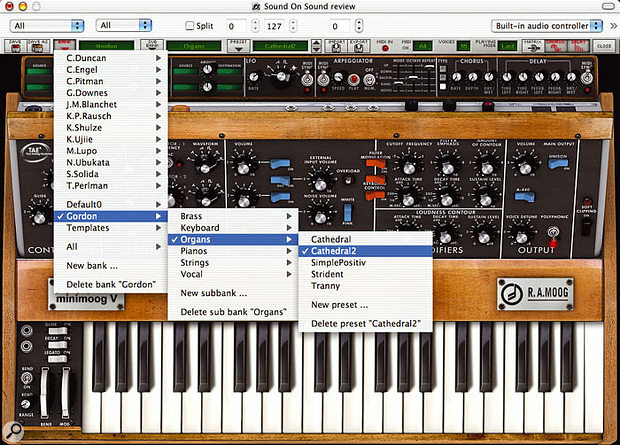 We see how they fare in their attempt to capture the mighty Minimoog in software. Arturia have been making quite a name for themselves of late. Notwithstanding their endeavours in the field of studio software, they have perhaps become best known for three software synths: Moog Modular V, the Yamaha-inspired CS80V, and the subject of this review, Minimoog V. This appeared in 2004, but it is in its latest incarnation, version 1.1, that it has supposedly reached maturity, with a number of minor bugs eliminated, as well as claimed improvements in its emulation of the original Minimoog's filter. The software works on OS 9 and OS X Macs and under Windows, with minimum spec for all platforms of a 500MHz processor and 128MB of RAM. It's also compatible with many plug-in host types: VST, DXi (only on PCs), RTAS, HTDM, MAS (only on OS 9 Macs) and AU (only on OS X Macs). As its name explains, Minimoog V is not designed to be 'Minimoog Five', but is instead a Virtual Minimoog, imitating its physical design, emulating its features, and claiming to duplicate its sound almost perfectly. If so, this means it is based on the architecture of the original Minimoog, shown opposite. The signal path begins with the Oscillator Bank, which offers three audio-frequency oscillators, one of which — Osc3 — also doubles as a low-frequency modulator for vibrato and growl, and as an audio-frequency modulator for FM sounds (all three oscillators have 'Lo' settings, but Osc3 is special, because of its routing capabilities, and because you can disconnect it from the keyboard CV). 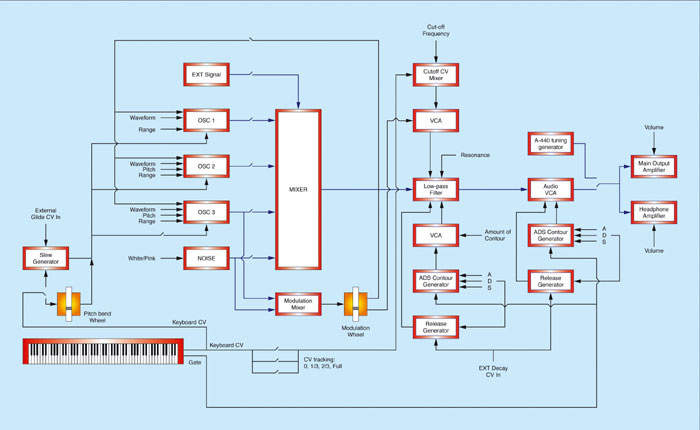 The outputs from the oscillators pass to a passive Mixer, where you can select which of them are permitted to travel down the signal path, and also add white or pink noise, as well as audio presented to the external signal input. Next comes the Minimoog's fabled filter. This is a single 24dB-per-octave low-pass device, with controls for cutoff frequency and 'Emphasis' (or, as we'd now usually describe it, resonance). There's also a knob to set the amount of the ADS (Attack, Decay, Sustain) envelope applied to the cutoff frequency. A Decay On switch determines whether the Decay time is also applied as a Release time. The final filter controls are three switches. Two of these provide keyboard tracking at rates of 0, 33, 67 and 100 percent, while the third applies modulation, provided by the Controllers section, or not. The amplifier structure echoes that of the filter envelope, with three controls — Attack, Decay and Sustain — and, likewise, the Decay On switch allows you to create an ADSD (Attack, Decay, Sustain, Decay) contour if you wish. Finally, the Controllers section allows you to mix the output from Osc3 and the noise generator to create a modulation signal, apply glide (portamento), and tune the instrument. Beneath these controls lie the pitch-bend and modulation wheels, the aforementioned Decay On switch, a second switch to determine whether Glide is on or off, and pedal inputs that duplicate the actions of those switches. A representation of the Minimoog, based on the diagram in the Moog service manual. And that's all there is to it. Except that on Minimoog V, it isn't — because Arturia have added numerous features that extend the original specification. This means that we have to judge Minimoog V in two ways: firstly as an imitation of the monophonic original, and secondly as an enhanced polysynth. I'll therefore start by making a direct comparison between Minimoog V and Minimoog #11235, which I've owned since the 1980s. The first test with any evaluation of this nature is to compare the naked sounds of the oscillators. As this is not possible, the best we can do is open the filters of both synths fully, defeat their resonance and filter envelopes, create 'organ' envelopes for the VCAs, and make sure that all the modulation is inactive. Setting Osc1 to a sawtooth wave on both instruments and matching the output levels at settings of around '5' (to prevent filter input distortion), I found that the two are — with careful tuning and adjustment — almost indistinguishable from one another. The same is not true of the square waves... the Minimoog V is far the 'squarer'-sounding of the two. However, this is not a criticism. I have long felt that the pulse width on my Minimoog needs a tweak to return it to its original 'hollow' tone. On Minimoog V, pressing the Shift key while dragging the mouse over the Waveform knob allows you to change the duty cycle of any of the pulse waves from 0 to 100 percent. I discovered that the duty cycle of my Minimoog is closer to 47 percent than 50 percent, which accounts for the difference in tone. Similar calibration inaccuracies in the vintage synth also result in timbral differences between the two instruments for the narrower pulses — not that these matter, given the ability to adjust the square wave's duty cycle. The triangle waves exhibit a far greater difference in tone, with Minimoog V being much the 'woodier' of the two. But now we come to the mixed triangle/ramp wave. This is audibly not the same waveform on Minimoog V as it is on my Minimoog. 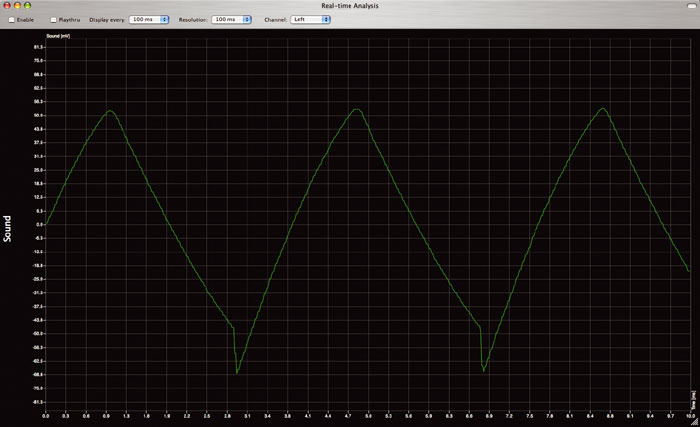 The difference is so significant that I have produced the two oscilloscope traces overleaf to demonstrate the point. While I had the oscilloscope running, I decided to check the other waveforms. The Minimoog V 's front-panel graphics are correct, with ramp (rising sawtooth) waves depicted for Osc1 and Osc2. Nonetheless, these settings produce falling sawtooth waves (the same wave but with its phase reversed). Likewise, the ramp setting on Osc3 produces a sawtooth, and the sawtooth setting produces a ramp! This means that the software is calculating the waveforms correctly, but that the phase of the output is inverted. It probably makes no difference at audio frequencies, but it's still not clever. On the other hand, it's only right to compliment Arturia on the addition of the user-definable pulse widths mentioned above, and on the ability to adjust the shape of the triangle wave and the triangle element within the triangle/ramp waveform from saw-like to ramp-like. There's also the welcome addition of chromatic tuning. Hold down the Shift key while adjusting Osc2 or Osc3 tuning, and the pitch changes in precise semitone steps. No specification is included in Arturia's marketing documents or manual, so I have compiled the following abridged version. Oscillators: Three, with oscillator sync (1 and 2). 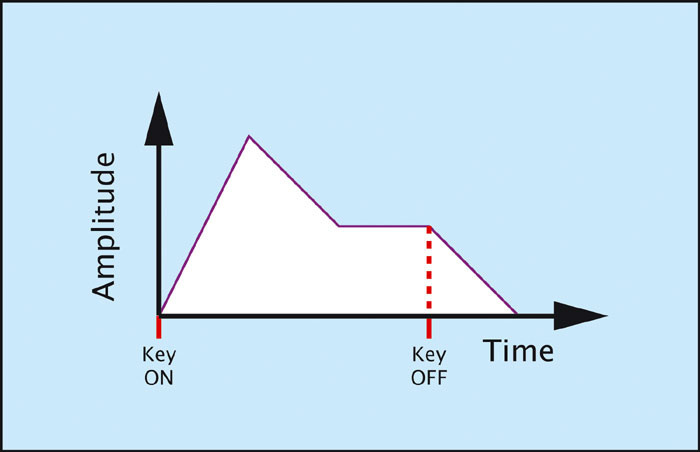 Pulse width: Pulse and triangular waveforms (with 0- to 100-percent width and PWM). Audio ranges: 32' to 2'. Tuning: ±12 semitones (coarse), ±1 semitone (fine). External signal input: Stereo, summed to mono. Polyphony: One to 32 voices, depending upon processor power. Unison: Two to 32 voices, depending upon processor power. Glide: Maximum 13 seconds; minimum near instantaneous. OSC1 & OSC2: Monophonic Lo mode. OSC3: Monophonic and free-running polyphonic modes. Dedicated LFO: Six waveforms, with MIDI sync. Filter: 24dB-per-octave profile, with self oscillation. Envelopes: Two ADS types with optional Decay to 0V. Minimum envelope Attack: Claimed instantaneous (measured approximately 1.25ms). Minimum envelope Decay/Release: Claimed instantaneous (measured approximately 7ms). Key priorities: High, Low, Last-note. The next stage in the signal path is the Mixer. On the real Minimoog, this is passive, which means that the oscillators can (albeit slightly) interact with one another. This is one of the subtle characteristics that make the instrument so warm and organic. However, Minimoog V 's mixer does not emulate this. If you have access to a copy of Minimoog V, try the following experiment. Set oscillators 1 and 2 to the same waveform and precisely the same pitch. Move to the Mixer, and balance the levels of Osc1 and Osc2. Now, switch Osc1 'On', and the other four sources 'Off'. Make sure that the filter is wide open. Next, play a note in the mid-range and switch on Osc2. A slightly louder sound with a different timbre is generated, and it's not hard to hear that this is because Osc1 and Osc2 are somewhat out of phase with one another. Well... that's correct. When, as on the original Minimoog, you have free-running oscillators, this is bound to happen. Now switch off Osc2, and then turn it on again. You'll obtain a new timbre, quite different from the previous one. Now try again. A third timbre emerges (or even silence if the two waveforms are completely out of phase with one another). However, if you hold the note indefinitely, the timbre never changes. There's no oscillator drift, just rock-solid waveforms separated by a random phase difference determined when you switch an oscillator on. There is a way to change this in monophonic mode: the Detune knob that normally shifts Unison voices with respect to one another in polyphonic mode acts as an oscillator drift control in mono mode, introducing an additional random drift (undocumented in the manual). A knob setting somewhere in the middle works best for the sustained notes. Before leaving the Mixer, let's jump to the far right of the panel, where we find the Soft Clipping control. This — according to Arturia — recreates the soft clipping and distortion that occur when you dial in high levels in the Mixer on a real Minimoog. On the original synth, this is yet another characteristic that contributes to 'the sound' and, to be fair, Minimoog V 's emulation does a reasonable job of thickening the output. Nonetheless, I couldn't understand why it was programmed such that the output level rose considerably whenever I switched soft clipping on, rather than diminishing as one would expect. The next major comparison is between the Minimoog's filter and the digital emulation on Minimoog V. The tool-tip on the Arturia's cutoff frequency knob claims minimum and maximum cutoff frequencies of 20Hz and 20kHz respectively. However, the actual figures (measured by making the filter oscillate) are 21Hz and 18.6kHz. By way of comparison, the maximum cutoff frequency on my Minimoog is way over 20kHz — too high to measure at a sampling rate of 44.1kHz. But this isn't going to make any significant difference unless you're a bat. At the bottom end, however... The ramp/triangle wave generated by a real Minimoog. One of the key and distinguishing attributes of the Minimoog is the nature of its filter resonance. This diminishes with lower frequencies, and is important in creating the 'punch' of the Minimoog, because lower resonance at low frequencies means that more bass passes to the output as you play down the keyboard. In contrast, the Arturia filter self-oscillates down to 21Hz, and the amplitude of this signal is greater at low frequencies than in the mid-range! It doesn't, therefore, emulate the Minimoog's filter. The ramp/triangle wave generated by Minimoog V.
I also noticed zipper noise. If you set the Emphasis to maximum and use the cutoff frequency control to sweep the frequency of the resulting signal, you obtain obvious zippering. At first I was not concerned by this because, if you hold the Shift key while adjusting many of the knobs you obtain finer movement, which should eliminate the problem. Indeed, when you hold Shift and turn the knob slowly, matters are much improved. But move the mouse rapidly and the zippering reappears. This means that the user interface is being polled too slowly by the underlying algorithm, and/or that Arturia have not interpolated between values to provide a smoother response. Nevertheless, I have some positive things to say about the filter. Firstly, if we ignore whether it's supposed to sound like that of the Minimoog, and evaluate it in purely sonic terms, it's rather good, with a rounded and warm character that many users will like. Secondly, unlike many digital filters, it requires no input from the oscillators or noise generator to initiate self-oscillation, so you can play it as an oscillator if you wish. With all five of the Minimoog's audio sources switched off and its contours set to A=0, D=0 and S=0, you should in principle hear nothing, because no signal is present and only a control voltage is being changed. However, this is not the case, and a brief click results. Considered a fault by many people, the ability of the envelopes to click is another attribute of the original synth that contributes to its 'snappy' character. A single ADSD contour. Unfortunately, Minimoog V does not do this. 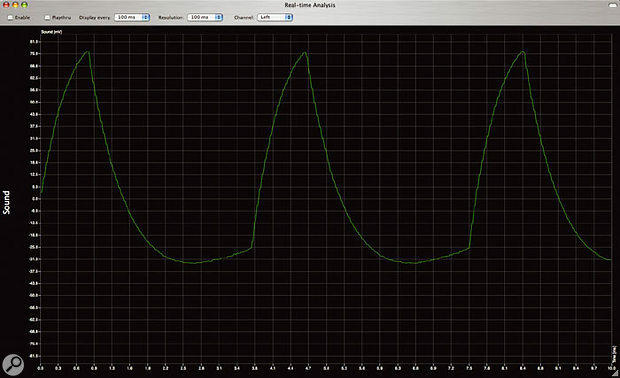 So, to measure its envelope response, I fed some white noise into the mixer, opened the filter fully, and set the VCA contour generator to produce as instantaneous an envelope as possible. The resultant click lasted about eight milliseconds. A similar measurement from my Minimoog reveals a duration of four milliseconds. However, more important than the total duration is the Attack time. On Minimoog V, this is about 1.25ms. On my Minimoog, it is closer to 1.5ms. The slightly superior figure on Minimoog V will ensure that it produces the same snappy attacks as the analogue synth. However, when you play quickly and non-legato (ie. triggering every note) on a Minimoog, the envelopes are reinitialised from the points to which they have dropped during the previous release. If you play a typical ADSD envelope (as shown right) this means that each successive contour 'climbs upward' if you play quickly, as shown in the second diagram. This is a critical element in the playing characteristic of the Minimoog, but Minimoog V does not emulate this, and its envelopes respond as shown in the third diagram, below. The detrimental effect of this is not subtle; imagine the difference between the loudness and brightness of a sound contoured by filters and amplifiers responding to the curves in the last two graphs shown. This diagram shows the contour generated by a real Minimoog played rapidly. And here's the contour generated by Minimoog V, played in the same manner. The next section is the Controllers panel. Starting with the Glide, I found that Minimoog V has a maximum Glide time of approximately 13 seconds across its 44-note keyboard, and a minimum that manifests itself as an almost instantaneous glitch (the glide is without 'zippering', by the way, which is good). The real synth, however, has a maximum Glide time of around five seconds and a minimum of zero, even with Glide 'on'. The Modulation Mix knob works as you would expect, and using Osc3 as an LFO to add simple vibrato to Osc1 and Osc2 works as on the Minimoog. In contrast, generating FM sounds by modulating at audio frequencies does not, although the differences could possibly be corrected by changing the amplitude of the modulation signal, or by replacing some of the aged components in my 30 year-old synth. Either way, the Minimoog and Minimoog V sound different, but I'm not too concerned by this. 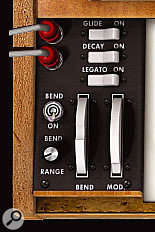 The upward bend on my Minimoog's pitch-bend wheel is approximately seven semitones, while the downward bend is nearer to eight — a deficiency of the original design. On Minimoog V, this has sensibly been corrected; in fact, you can set the pitch-bend to a precise interval of between zero and 12 semitones, in semitone steps. This is excellent news, but Minimoog V 's pitch-bend also seems to lag the physical movement of the controller by a tiny amount, which will upset some players. As on the genuine Minimoog, the software synth has an external input, and although this accepts stereo signals rather than the monophonic signals accepted by the vintage synth, it sums them to mono, as you would expect. I tried directing the output from a Korg Legacy Polysix to the external inputs of Minimoog V, having triggered both software synths from the same MIDI signal. This configuration creates timbres similar to those generated by using CVs, Gates and S-Triggers to play a real Polysix through a real Minimoog. But the differences in Minimoog V 's filter and contour generators ensure that the timbre and response are not the same. 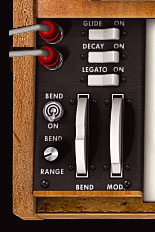 If you look at the External In on/off switch on Minimoog V, you will see that it has a third position: 'Out'. This allows you to 'virtually' feed Minimoog V 's output back into its own External Input, and is included to replicate the old trick beloved of many Minimoog aficionados whereby, if you feed the Low output back to the External Input and monitor with the High output, you get a slight but very pleasant thickening of the sound. If you feed back the High output and monitor with the Low, the feedback dominates at all but the lowest External Input volumes, and the synth takes off into the nether regions of sonic wobbledom. Minimoog V emulates the latter, and you can create some radical timbres if you set up the oscillators, filter and external input correctly. This sounds different to how it does on my Minimoog, but this point doesn't concern me too much; of the three Minimoogs I've owned, all have all responded to the High feedback loop differently from one another, so you could say that Minimoog V is just another variant. VCO 1 & 2 FM. VCO 1, 2 & 3 FM. VCO 1 & 2 PWM. VCO 1, 2 & 3 PWM. VCO 1 & 2 AM. Given the number of differences I've flagged between the Minimoog and Minimoog V, I expected the two instruments to sound very different from one another. Yet, creating simple patches on both, using a single sawtooth wave and fine-tuning the controls to be as close to one another as possible, I found the sound from the software synth to be surprisingly authentic. Moreover, in blind tests that I carried out on two knowledgeable friends, both could hear that there were two instruments present, but neither could reliably identify which was the 30-year-old lump of wood and circuitry, and which was the software emulation. But the more I introduced filter resonance, the easier it became to distinguish between them. If I then used different waveforms or introduced multiple oscillators, it became simple to identify which synth was which. And when I stopped playing individual notes in isolation, and started to play riffs and melodies, the incorrect envelope generation of Minimoog V made it obvious which was which. This was when I also started to notice that the timbre would jump slightly after every handful of notes played. Playing rapidly with the Detune knob (ie.drift) set to zero, and while watching the waveform on an oscilloscope, I could see that the relative phases of the oscillators would occasionally jump from one state to another. As expected, there was no change when I held a single note indefinitely, just a quantised jump after a bunch of notes were played. This makes soloing an odd experience, and may be even more disconcerting for players who use their Minimoogs primarily for bass work. I also noticed Minimoog V generating random clicks when I played quickly with instantaneous (ie. Attack = 0, Decay = 0) envelopes. These are not the Attack On and Release Off clicks of the original synth, but digital clicks generated in the software as it fails to handle the rapid envelope settings. 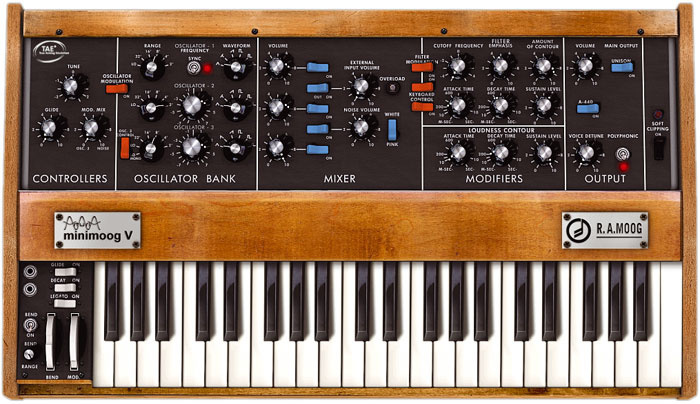 All in all, I have to report that, judged as an emulation of the real thing, Minimoog V is a disappointment. How could I conclude otherwise? Despite sounding very good at times — indeed, rather Moog-like at times — its oscillators, mixer, filter and envelopes all behave in a significantly different manner from those of the original. Sure, it looks like a representation of a Minimoog, and it has a very likeable character — big and imposing. Nevertheless, generally speaking, Minimoog V doesn't respond to my playing as a real Minimoog does. So what if we ignore the pretty picture on the screen, and judge Minimoog V as a synth in its own right? The inaccuracies in the emulation are then irrelevant. Considered like this, what we have is a fat-sounding, interesting, and sonically imposing synthesizer that can sound excellent, albeit with a couple of operational quirks and bugs that need correcting. Let's move on, and consider the ways in which Minimoog V adds facilities that were not present on the hardware it seeks to emulate. These fall into three primary categories: voicing enhancements, improved modulation, and effects. Following the same signal path as before, the first addition we encounter is the Sync switch in the Oscillator Bank. This 'hard'-synchronises Osc1 to Osc2 so that Osc1 determines the pitch of the sound while Osc2 determines its harmonic content. This was not an uncommon modification on original Minimoogs, so its inclusion in Minimoog V is welcome. Minimoog V 's third oscillator has two low-frequency modes. 'Lo Mono' causes it to act as a single LFO applied to all the notes that may be playing at any given time, while 'Lo' causes it to act as a colony of free-running LFOs, one for each note, whether played polyphonically or in unison. Which brings me to the next point — Minimoog V is, of course, not monophonic like the original Minimoog. Arturia's front panel has a Unison On/Off switch, together with a Voice Detune amount, plus a switch labelled 'Polyphonic'. And in the tool bar that sits above the image of the Minimoog itself (see the screen above ), you'll find an unassuming setting labelled 'Voices'. To play the Minimoog V polyphonically, you turn the Polyphonic switch on and the number of voices becomes the number of notes available to you (up to 32, depending on the available processing power). To stack the voices, you turn on Unison and can then use the Voice Detune knob to thicken the sound to your taste. You might expect this to create some really big sounds, and you would be right... this is way beyond standard Minimoog territory, and it can sound superb. You can't use polyphony and unison together, though — polyphonic sounds always comprise a single voice per note. The controller section has three new controls. Firstly, the bend on/off switch disconnects the pitch-bend wheel from the pitch of the oscillators. This frees up it up for other duties — specifically, to be used as a control source in the Modulation Matrix that I'll describe below. We've already discussed the second control, Bend Range, so we'll move on to the third; the Legato switch. This switches between single-triggering (Legato On) and multi-triggering (Legato Off), and is best used in conjunction with the Playing Mode setting in the tool bar, which offers high-, low- and last-note key priorities. For reference, the Minimoog is a low-note priority, single-triggering instrument. Assigning MIDI controllers to the controls on Minimoog V (including the matrix amounts) could not be simpler. On a Mac, you press the Command/Apple key and click on the knob or switch you wish to assign. Click on 'Learn' in the window that then appears, and the next MIDI CC or command you send from the controller keyboard or sequencer will become the controller for that function. As a bonus, you can direct a single controller to as many functions as you wish, making complex timbral changes possible using a single knob, slider, wheel or sequenced MIDI continuous control message. I like this. Furthermore, if your host application supports automation, the panel controls of Minimoog V will respond to this. However, cable changes for the Glide on/off and Decay on/off pedal inputs (see the box at the end of this article) cannot be automated. At the right end of the toolbar, you'll find three buttons marked Matrix, Chorus and Delay. You access the facilities to which they refer by clicking on the Open button alongside them, or by clicking on the wooden bar at the top of the control panel. This reveals a hitherto hidden set of controls for the modulation matrix and effects, as well as an arpeggiator and an additional LFO (see below). The modulation matrix provides six slots, each with the same 12 sources and 32 destinations detailed in the box on page 214. An Amount knob calibrated from -1 to +1 applies the source to the destination at amplitudes ranging from full with negative polarity, though zero, to full with positive polarity. Organising sounds into banks, sub-banks and presets. Being a 'hands-on' synth player, I'm particularly pleased to see the performance-oriented additions within the matrix. In particular, I'm delighted that MIDI Aftertouch and Velocity are two of the modulation sources. I was disappointed to see Osc1 and Osc2 omitted from the source list, but the six slots nonetheless provide a huge number of options, extended still further by the fact that some are recursive. For example, you can use the output from Osc3 to modify the amplitude, pulse width and frequency of... Osc3. This takes you into some wild audio territory more usually the preserve of modular synths. Other useful things you can do with the matrix include sweeping Osc2's pitch using all manner of modulation sources. When Sync is on, this can produce the 'tearing' sounds that made the Moog Source such a desirable instrument. In addition, having six slots, you can combine these 'sync' sounds with velocity and aftertouch response to do things that were never possible on the Source. This is very good stuff. Or at least, it would be if it all worked. For example, try using Osc3 as an amplitude modulation source for either Osc1 or Osc2 to create ring modulation. It doesn't work. Something happens at low amplitude, but it isn't what I would expect. Alongside the modulation matrix, you'll find the additional LFO (again, this was something that was added to numerous 'real' Minimoogs). It offers six waveforms including S&H, with MIDI sync from one eighth of MIDI tempo (ie. one eighth of an LFO cycle per crotchet) to eight times MIDI tempo. For freeing up Osc3 for audio duties, or acting as a second LFO on a dual-oscillator synth, it's just the job. To the right of the LFO lies the monophonic arpeggiator, which offers five modes (including my favourite, 'Random' mode), a dual-function MIDI sync/speed knob, a range of one to five octaves, and a choice of how many times each octave is played before moving on to the next. There are also three 'Hold' options: off, hold the last set of keys played, and remember all the keys played since the arpeggiator was last switched on. The last of these allows you to build complex and interesting patterns, even if the only keyboard available to you is the monophonic representation on the computer's screen. You can even remove unwanted notes from an arpeggio by placing the switch in the 'off' position and playing the offending key. However, this also causes the arpeggio to glitch, so it is of dubious use. You can't use the arpeggiator as a basic sequencer, either, because playing the same note twice does not insert it into the arpeggio a second time. The tool bar, which sits above the main Minimoog V window, contains all the controls relating to patch management, as well as important MIDI and voice settings. This is also where you gain access to the hidden control panel. In common with other Arturia products, the effects added to Minimoog V comprise a stereo chorus and a stereo delay (no reverb). The chorus has three 'types', described in the manual as Simple, Medium and Complex. I discovered that Simple has two audio paths; the unaffected signal and a single modulated signal. Medium has three audio paths, and Complex has four. You control the modulation using three controls: Rate (which doubles as the sync rate when the MIDI Sync switch is 'on'), Depth, and Dry/Wet balance. However, while investigating the chorus types, I found that when Rate is set to zero there is never an offset, no matter where you stop the modulation in its cycle. I checked and found that the Rate control also affects Depth. 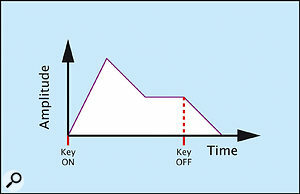 As you increase modulation speed, you also increase the range of frequencies over which the modulated signals are swept. Irritatingly, this means that — for a consistent effect — you have to decrease Depth if you increase Rate, and vice versa. I can't see any reason for this restrictive clash of functions. The 'hidden' section of Minimoog V, accessed via the tool bar, extends the function of the original instrument considerably with a modulation matrix, an extra LFO, an arpeggiator, and effects. Finally, we come to the Delay processor. This is a simple stereo delay with left and right channel outputs, but no cross-delays, and no way to balance the channels independently. The five controls offer delay times and feedback for each channel, and a single wet/dry mix knob. The only additional feature is MIDI sync, with the same range of values as the LFO and chorus effect. If you use Minimoog V as a monosynth with multiple voices and unison, or as a polyphonic synth that offers sync, complex modulation, a dedicated LFO, arpeggiation and effects, all pretence that the package is supposed to be some kind of Minimoog can be dropped — and having left behind the disappointment of this impersonation, it leaps to life. The unison mode is superb, and if you don't overdrive the analogue stages in your signal path, it can be the source of some huge, deep sounds. If you click on either or both of the inserts on the controller panel, two cables will appear (see the screenshot). If you then connect a pedal to a suitable MIDI controller, it will switch Glide and/or Decay (Release) on or off, as appropriate. If neither of the plugs are 'inserted' in this panel, the pedal will act as a sustain pedal, holding the sound at the Sustain Level until released. Moreover, Minimoog V is a polysynth with great depth and character; I was soon programming and organising some excellent string synth sounds, brass ensembles, orchestral sounds, organs (stunning cathedral organs!) and pads that impressed me greatly. I was far less successful with pianos and other percussive emulations, but weird sound effects and off-the-wall cacophonies leap forth almost unbidden once you start to experiment with the matrix. Yet still there are problems. For example, if you route Velocity to VCA amplitude in the modulation matrix, anything more than a smidgen of 'Amount' produces a raucous overload in the signal path, and you have to reduce the levels dramatically to obtain the required velocity-sensitive version of the original sound. This brings me to the subject of distortion, and digital overloads, both of which Minimoog V sometimes generates without warning. These are clearly generated within the software, but not as a pleasing emulation of analogue compression/distortion, as is supposedly generated by the Soft Clipping function. It sounds to me as if something in the maths has gone awry, resulting in digital overflow or something similar. As for Soft Clipping itself, this draws hugely on the available processing power, and couldn't be used on my test system with a unison/polyphony of greater than four voices, even with other facilities unused (and that's four voices including the tails of previous notes, of course). Exceeding 100 percent leads to very unpleasant digital glitching. In the manual, Arturia state, 'the emulation of the overload circuit is heavy on calculation power, and should be avoided with polyphony or unison'. They're not wrong. Nonetheless, the polyphonic sounds can be superb, so rather than give up on Minimoog V as a polysynth, I'd like Arturia to do something about it. Had Arturia designed the on-screen representation differently, Minimoog V might have scored as a very good software synth. But when used as a software Minimoog, I feel that it falls far short of the winning post. Of course, you might be asking whether you should care if it sounds authentic. Well, consider it like this; if I offered to sell you a software synthesizer with limited envelopes, a single filter, a limited number of modulators, and so on... would you be prepared to shell out £150 if it was presented using standard graphics laid out in no particular fashion? And if you wouldn't, why should you be willing to pay £150 for a pretty picture? In conclusion, Minimoog V is a CPU-hungry softsynth capable of some first-class, warm and engaging timbres, some of which sound not quite like a Minimoog. But if Arturia could eliminate the digital overloads, sort out some of the bugs and operational peculiarities and reduce the processor load, this could be an excellent synth. If they could then redesign those aspects of its implementation that do not resemble those of a real Minimoog, it could be the Minimoog emulation it promised to be. I'm waiting for version 1.2 or, better still, the rewritten v2.0. Excels as a triple-oscillator polysynth. Works with every operating system and software host you're likely to use. Simple, flexible MIDI controller implementation. The oscillators behave differently from those of the original Minimoog, as do the filter and the envelopes. Prone to digital clicks and overloads. Aside from some operational oddities, some bugs, and its propensity to digitally overload, Minimoog V is a fine software synth in its own right, and is capable of some excellent polyphonic sounds. However, it fails to emulate the behaviour of a real Minimoog in several key areas. Whether that matters is up to you.